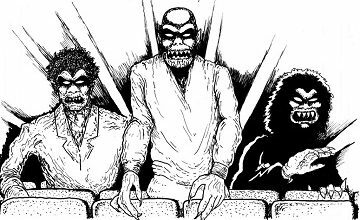 In this special edition of the Really Awful Movies Podcast, Jeff interviews a slew of luminaries who attended the Shock Stock horror convention in Southwestern Ontario this summer. Dan Hicks. Hicks is best known for his roles in Evil Dead II, Darkman and also, Intruder, one of the coolest and most overlooked slashers of the 1980s. Mink Stole. Baltimore-born Stole is a longtime friend and collaborator of John Waters. Born Nancy Paine Stoll, she of course is known to our listeners for her amazing roles in Pink Flamingos, Polyester and Hairspray and many many others. An ordained minister, Stole has five decades’ experience in film and television. Kevin Van Hentenryck was the extraordinarily memorable (and not just for his hair), Duane from the sweet and scary Frank Henenlotter romp, Basket Case, a film which perfectly captures the NYC grind-house aesthetic of the time. Doyle Wolfgang von Frankenstein is the towering axeman in the Misfits, who’ve reunited with metal belter Glenn Danzig and Jerry Only. If you don’t know their music, you most certainly know their logo, perhaps second only to Motorhead or the Ramones in ubiquity. One of the coolest graphics you’ll ever see, inspired by The Crimson Ghost. Ari Lehman is the first Jason! He was a child actor in the seminal first Crystal Lake terror. He talks about his film career and how it informs his new role as a musician. Greg Lamberson directed one of our absolute favorites, the wonderfully quirky Slime City. The Buffalo resident recently directed the fun (and mammary) filled Killer Rack. A Michael Baldwin was cast at age 13 for the role of Michael in The Tall Man indelible horror classic Phantasm. Robin Bougie is an underground comic artist, best known for his amazing Cinema Sewer and Graphic Thrills. Lloyd Kaufman needs no introduction! The Troma legend wrote the foreword to our book, DEATH BY UMBRELLA! The 100 Weirdest Horror Movie Weapons.